Following is an excerpt from the fully revised and expanded second edition of Make Their Day! 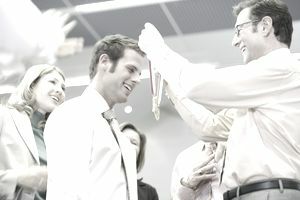 Employee Recognition That Works (Berrett-Koehler May 2009) The book is written for managers. This chapter focuses on how Human Resources can help managers provide the best possible recognition for employees. Imagine you work for a company where the Human Resources department arranges for every employee to receive a potted plant on the anniversary of his or her hire date. The computer generates a list of employees with upcoming anniversaries, an HR employee creates the purchase order, and a florist delivers your plant. When your manager walks by your desk and notices that you have received the standard anniversary plant, she says, “Oh, is it your anniversary?” At that moment, how recognized do you feel? Does it matter to you that the people in HR know it’s your anniversary? Unless you have a relationship with HR, it probably doesn’t. For most people, this kind of recognition has about as much value as a computer-generated birthday greeting from their life insurance company. This isn’t just a hypothetical example. This is the story of a real employee who was the victim of outsourced recognition. As her story illustrates, recognition only has meaning when it comes from people who benefit from your behavior or have a direct interest in your achievements. Recognition that comes from recognition program administrators, whether in HR or Communications, is cold, impersonal, and a waste of company resources. To turn around the anniversary plant idea, the manager needs to play an active role. If your organization has a service program, participate. In this example, HR can still generate the anniversary list and order the plants, but their representative should deliver the plant and the name of the employee directly to you, the manager. HR might take it a step further and provide an anniversary card. After that, it’s up to you to prepare a personal note and deliver the plant. You will determine whether the anniversary gift makes a positive impression because it’s the interaction between the employee and manager, and not the plant itself, which is meaningful. A major reason recognition programs fail is that recognition gets outsourced to administrators. Remember the 50/30/20 Rule of Recognition. Employees want the majority of recognition to come from their manager. It is okay for administrators to support your recognition efforts, but not to provide the recognition itself. In the best organizations, you, as a manager or supervisor, are responsible for recognition while your recognition administrator guides and supports you, remaining behind the scenes, influencing and coaching, rather than trying to lead. Wells Fargo provides a good example of this approach. According to Cheryl Miller, Recognition Manager for Wells Fargo Technology Group, recognition coordinators (RCs)* in her group work with managers to keep recognition efforts front and center. These RCs offer many services: they coordinate events, administer nominations, offer training and coaching, and much more. Having them compile nomination information from business partners and customers. You may not have a recognition coordinator in your organization, but your HR or Communications team can probably provide you with some of the services described in the two examples given. Wells Fargo RCs also provide managers and supervisors with questionnaires to help them learn more about their team members want. When the people in HR discover that job satisfaction is suffering because employees crave recognition, they often find themselves in a frustrating position. They have identified a need and want to do something to correct the problem. If managers ignore the problem or plead that they don’t have the time, often HR will take the lead. They create sophisticated and imaginative programs, survey employees on preferences, create metrics and track results. While HR’s intentions are admirable, inevitably, if you the managers don’t drive recognition, their efforts are usually wasted. As a manager who wants your people to feel recognized, you have to be willing to accept responsibility for recognition. You can allow HR to support you but not replace you. HR can provide services that play a pivotal role in the recognition process. The expertise this department provides is often crucial. HR staff can greatly assist your recognition efforts. They can significantly improve the recognition process and employee job satisfaction. You can leverage the work they do in creating and managing programs, surveying, and offering training to make you most effective. Design and implement great programs. Track what works and what doesn’t and use this knowledge to recommend effective changes. Train managers on the organization’s recognition programs. Provide coaching to managers and supervisors. HR is there to support you in your recognition efforts, but it can’t offer meaningful recognition for you. *Wells Fargo RCs are volunteers who come from all over two divisions. They do their recognition work in addition to their regular duties. Cindy Ventrice is a research-based writer, with the goal of helping organizations create a culture of appreciation and improve engagement through assessment, manager training, and recognition program development, revamping and roll out.